As they stood like monuments of patience, awaiting their chance to extend greetings to Congress president and UPA chairperson Sonia Gandhi on her 58th birthday, party workers and supporters outside 10 Janpath seemed to be in no mood for low key revelry. Traditional dancers from Karnataka performing outside Sonia Gandhi’s residence on her 58th birthday in the Capital on Thursday. The Municipal Commissioner, Mr Rakesh Mehta, in his revised budget speech of 2004-2005, today proposed a professional tax on citizens of Delhi earning more than Rs 30,000 per month. However, journalists have been exempted from this category. The Delhi Police has been told to investigate properly the case registered against the daughter of Chief Minister Sheila Dikshit for assaulting a lawyer a few months ago. In his order, Metropolitan Magistrate GP Singh today also told the investigating agency to follow the procedure and precedents while conducting the probe. The Union Minister of Health and Family Welfare, Dr Anbumani Ramadoss, laid the foundation stone of the Positron Emission Tomography and Medical Cyclotron Project at the prestigious Army Hospital Research and Referral today. Health Minister Dr Anbumani Ramadoss laying the foundation stone of PET and MC project at the Army Hospital Research and Referral in the Capital on Thursday. Kousalya, Shabana, Shanti and Asha are all HIV positive. They, along with more than 5,000 women who are part of the Positive Women Network (PWN+), a self-help group of women afflicted with HIV, have accepted the reality and are now helping others cope with their condition in a positive manner. The unprotected monuments in Chirag Delhi are not in a good state of preservation and do have problems of encroachment, Union Minister for Environment and Forests A. Raja told the Lok Sabha. With the arrest of five persons, the Delhi Police claim to have busted a gang of automobile lifters and chain snatchers who have been striking in the South district in the last few months. A Delhi court today sentenced three persons, including two brothers, to life imprisonment for killing a betel (pan) seller who refused to give them cigarettes free. Leading the crowd of well wishers were Prime Minister Dr. Manmohan Singh, several ministers, Chief Minister Sheila Dikshit, her colleagues and many senior party leaders. Despite Ms Gandhi being reportedly keen on a quiet bash, party colleagues decided to put up a grand spectacle. Dancing, singing and making merry outside her residence, the revellers put up similar shows outside the DPCC office. The roads leading to 10 Janpath and the DPCC office on Talkatora Road were clogged with visitors’ cars. The vehicular movement in the area was affected and the traffic had to be diverted to avoid jams. Even as the celebrations reached a crescendo outside, the scene inside 10 Janpath was just as ecstatic. The securitymen remained constantly on their toes as Ms Gandhi received the dignitaries by the minute. Ms Gandhi also came out of her residence and thanked the workers. Despite the security restrictions she mingled with the crowd and also shook hands with many. 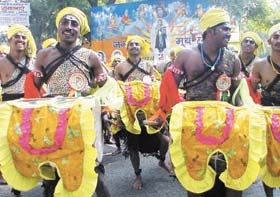 Folk dancers and musicians also joined the festivities by performing on Akbar Road, which was closed to general traffic for nearly eight hours. If the DPCC office celebrated the occasion by donating blankets and sewing machines to the needy, students donated blood to mark the day. Led by AICC Secretary Sudharkar Reddy, 100 students from the Delhi University donated blood on the occasion. Reddy also presented Ms. Gandhi 10,000 of her photographs for her to sign and these, he claims, will be distributed among students, especially those residing in slums, to educate them on the “sacrifices made by Ms. Gandhi”. The Professional Tax would yield approximately Rs 50 crore during the year. The proposals for the new tax were prepared and tabled before the Standing Committee of the corporation, following the recommendation of the Second Finance Commission. The collection from this tax will help the corporation to finance new schemes and increase expenditure of the CSE services, the Municipal Commissioner said. Earlier, the limit was fixed at Rs 5000, but owing to opposition in various quarters, the limit had been raised to Rs 30,000 in the budget proposals. While addressing the chairman and members of the Standing Committee, the Municipal Commissioner said that the tax rate for industrial and other commercial properties under category A-E has been reduced to 10 per cent. Earlier, the rates were 6 per cent, 10 per cent, 15 per cent and 20 per cent, respectively. These properties have been given one factor, as it will make it easy to calculate the tax. The rate of tax for properties of F, G and H factors is six per cent only. It also envisages changes in the building bylaws, basing it on the location of the building, as the current bylaws are 21 years old and they require certain changes. An expert committee headed by the commissioner himself is addressing the issues and the first draft is ready. He has also proposed to establish a close link with the tourism industry and the need to have better interaction with the hospitality industry and the institutions dealing with tourism like DTTDC. There is also a proposal to revamp the advertising policy to generate more revenue, and also to effect changes in the parking policy. The MCD has proposed the building of multi-layer parking lots in the Capital to cope with the problems of congestion on roads and shortage of parking space. The Delhi Police had registered a case against Mrs Latika Dikshit Syed over charges of assault on a lawyer. The case was registered at the Tilak Marg police station following court’s directions on a complaint by an advocate, Mr Akshay Kumar Sharma. The court had directed the SHO to submit his status report today. “Let the copy of this order be sent to DCP (New Delhi) for information and necessary actions and for getting the investigation done in the manner as embodied in Chapter XII of CrPC in right earnest,” Metropolitan Magistrate GP Singh said in his order today. The investigating officer has been told to appear with status report on February 5. According to the additional station house officer of Tilak Marg Police Station, Mr VP Sharma, notices had been given to Akshay Kumar Sharma on three occasions but he had not joined the investigation for one reason or the other. Mr Sharma, in turn, claimed that sufficient time had not been given to him for joining the investigation. Observing that the complainant is expected to assist the police for reaching a fair and just conclusion and that the investigating agency must not only follow the law but also keep its eyes open, Metropolitan Magistrate GP Singh did not agree with the method adopted by the agency. “[It] cannot be said that the investigating agency doing investigation under Chapter XII CrPC is empowered to record the statement of alleged accused under Section 161 CrPC [which] has been meant for recording statements of the witnesses alone,” read the order given by the metropolitan magistrate. The Union Minister of Health and Family Welfare, Dr Anbumani Ramadoss, laid the foundation stone of the Positron Emission Tomography and Medical Cyclotron Project at the prestigious Army Hospital Research and Referral today. The project is a part of the department of Nuclear Medicine of the Army Hospital R & R and involves the setting up of a Medical Cyclotron for in-house production of positron emitting isotopes and a PET/CT scanner for imaging. The PET/CT has emerged as a very important diagnostic tool for molecular imaging in the field of Oncology, Cardiology and Neurology. 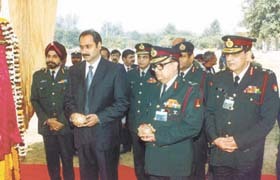 The establishment of this facility will give a boost to the super specialty care for patients at the Army Hospital R & R.
Lt. General J. R. Bhardwaj, Director General Armed Forces Medical Services, welcomed the Union Minister at the function, which was attended among others by Heads of Medical Services of Army, Navy and Air Force. Speaking of the occasion, the Minister lauded the progress made in the field of medical sciences and the high standard achieved by the doctors in Armed Forces. He stressed the government’s commitment to ensure quality super specialty care in addition to the primary health care. Kousalya, Shabana, Shanti and Asha are all HIV positive. They, along with more than 5,000 women who are part of the Positive Women Network (PWN+), a self-help group of women afflicted with HIV, have accepted the reality and are now helping others cope with their condition in a positive manner. They have had the courage to stand up in a society where a woman is generally discriminated against, more so if she is HIV positive. Now, they can hope to lead a life that is not secluded, is free from stigma and discrimination with all rights intact. “We want a life just like yours,” said these women, who are participating in a three-day national consultation here on women living with HIV/AIDS. In a declaration adopted today, the last day of the meet, they have demanded formulation of policies and programmes related to victims of the disease besides involvement in all decision-making processes. They have also expressed the hope that the consultations will result in evolving new strategies and forging new partnerships for strengthening the response towards HIV and AIDS. Several HIV positive women from all over the country and from different government departments participated in the consultations which focussed on planning a cohesive response strategy and drafting a declaration on the issue of women living with HIV/AIDS. Considering the fact that there are 5.1 million HIV positive persons in India, of which nearly 36 per cent are women, the AIDS challenge needs a better response from every sector. The PWN+ has members from 16 states, including Punjab, Haryana and Delhi, and was formed in 1998 with the active support of the Tamil Nadu State AIDS Control Society and UNIFEM, to deal with issues requiring localised action and responses besides ending discrimination that HIV positive women face from their families and society. Shabana from Mumbai and Shanti from Chennai, both members of the PWN+, are aware of their condition for more than 10 years now. They say an HIV positive woman faces more discrimination as often she is held responsible, especially if tested before her husband. “The epidemic impacts women differently. As it is, we are biologically more prone to the infection. Then, we also have to bear additional burden, including stigma from the society,” says Asha, whose family did not support her when she tested positive 10 years back. Today, awareness and knowledge have resulted in her being together with her family. “ Now they are my biggest supporters,” she beams. Bahlol Lodi’s tomb and Lal Gumbad are the only two protected monuments in Chirag Delhi as per Ancient Monuments and Archaeological Sites and Remain Act, 1958. “While Bahlol Lodi’s tomb is in good state of upkeep and maintenance, Lal Gumbad is encroached upon and the matter is presently sub judice in the High Court of Delhi,” Mr Raja said. While Chirag Delhi gates are not protected, the Old Fort (Purana Qila) is under protection of the Central Government. The Archaeological Survey of India is not concerned with the maintenance and upkeep of unprotected monuments. CHILD LABOUR: Delhi is one of five states where an Indo-American project to eliminate child labour will be implemented. Union Minister of Labour and Employment Chandrasekhar Rao told the Rajya Sabha that the Union Government and the US Department of Labour have launched a child labour project. REGISTRATION OF NEWSPAPER: Delhi tops the list of states and union territories that have received the maximum number of application for registration of newspapers. The Lok Sabha was informed today. With the arrest of five persons, the Delhi Police claim to have busted a gang of automobile lifters and chain snatchers who have been striking in the South district in the last few months. The accused have been identified as Anil Chauhan (34), Raj Kumar (36), Sonu Singh (21), Deshraj (60) and Geeta (28). Of these, Geeta is wife of Anil Chauhan. They all were arrested by the South District police last night. The police claim to have solved 70 cases of snatching and auto lifting with these arrests and have recovered four stolen cars, five cellular phones, implements for making duplicate keys, around 5000 keys and forged registration certificates and stamps of different registration authorities with fake number plates etc. The police said that during interrogation the accused had revealed that they were using a Santro car to commit the crimes as it was a good getaway car. The Santro car was stolen from the Anand Vihar area, the police added. The gang members also disclosed that they had sent more than 50 cars to their receiver, Pukavi, in Nagaland. Rajkumar was planning to send another fresh consignment of stolen vehicles to Nagaland in a day or two. These were a couple of Toyota Qualis cars that they had hidden in a Metro Station parking lot; the two cars, which have now been recovered, were stolen from Preet Vihar and Tilak Marg. During interrogation, it was also revealed that Anil Chauhan and Raj Kumar were into auto lifting for the last seven years. The duo were expert in making keys and could fabricate in just five minutes. They have stolen more than 500 vehicles by now. Additional Sessions Judge Indermeet Kaur Kochar also imposed a fine of Rs 1,000 each on Rajesh, alias Nawua, and Sanjay, alias Aloo, both brothers, and one Amit, alias Soni, for killing Satya Prakash, alias Santosh, the pan seller, and injuring a tailor who came to rescue him. The police said a quarrel broke out on December 4, 2002 between the accused and the panwala who asked for money for the cigarettes procured from his shop in Dev Nagar area. The accused had refused to pay for the cigarettes. On December 9, the accused came to Satya Prakash’s shop and injured him seriously with sticks and knife. They also injured Mohammad Safeeq, who owned a tailoring shop nearby, when he came to rescue Satya Prakash. Following a call that two persons were lying on the road, a PCR van took them to Lady Hardinge Medical College and Hospital, where Satya Prakash was declared brought dead. The accused were arrested from the New Delhi Railway Station two days later and the knife, sticks and blood-stained clothes were recovered on the basis of disclosures made by them during interrogation. With the arrest of three persons, the Delhi Police have busted a gang of bootleggers and recovered 120 cartons of liquor from their possession. The police have also recovered one TATA 407 and a Maruti car from their possession. The accused persons have been identified as Rajender Kumar, Rajeev and Ramesh. During investigation, they revealed that they were bringing the liquor from Bhiwari, Rajasthan, and would supply the same in Delhi. In another case, the police have arrested two persons, Mahesh Chand Gupta and Vinod, for carrying a large quantity of illicit liquor. The Delhi Police have arrested eight persons for allegedly running a LPG pilferage racket. The police have recovered 147 half-empty LPG cylinders, three gas refilling machines, six weighing balance equipment and 168 delivery slips from their possession. The accused have been identified as Avedesh Kumar Tiwari, Sher Singh, Yashvir Singh, Shyamvir Singh, Surinder Kumar Tiwari, Rakesh Kumar Chauhan, Neeraj Kumar Chauhan and Sanjeev Kumar. Giving a boost to Delhi government’s plans to overhaul the transport sector, improve the water supply and speed up urban development, the Planning Commission today allocated Rs 5,100 crore to it for 2005-2006. Of this, Rs 1,365 crore would be spent on transport related projects like Metro, high capacity bus service, integrated bus-rail system, flyovers and bridges. Urban development would get Rs 15 % (Rs 785 crore), water supply 14% (rs 732 crore), medical and public health 12 % (Rs 606 crore), power sector 10 % (Rs 448 crore) and education 9% (Rs 437 crore).